Some of the Dallas Cowboys took part in a home run competition in Frisco yesterday for charity. Dez Bryant missed the competition because he went to the Ballpark in Arlington. The older lady being body slammed and thrown in to the pool in Florida after complaining about the noise at a party is hard to watch. The championship winning Desoto football coach kept his job last night but the proceedings were a little wheels off. It was reported that he requested any discussions about him by the school board take place in public which prevented them from discussing him in executive session. I'm not sure I knew that rule. And is there any question that the Texas Open Meeting law is violated every day? Some city councils, commissioners, and school board members talk about the upcoming agenda all the time, right? I keep waiting for the Texas housing market to crash -- and it will happen -- but this increase in prices over the last handful of years is unlike anything I've ever seen. Fox 4 had a story of someone finding a dinosaur tracks in Springtown. Everyone was touching and rubbing them which seemed weird. Balch Springs police officer Roy Abbott Oliver turned himself over the weekend on a murder warrant, and his book-in photo looks like he has had some sleepless nights. And I bet he has. 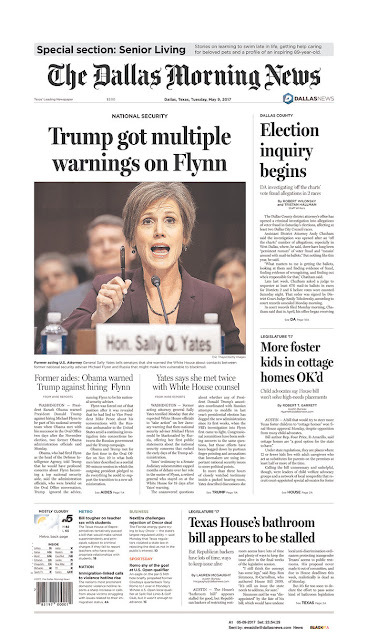 The Sally Yates testimony was action packed yesterday, and it was not a good day for the White House. On the evening shows, CNN, MSNBC and even the BBC led with it. Fox News led with Obama's speech from the weekend. I don't like it when we have a visiting judge because you never know what to expect. I don't know how criminal defense lawyers practice in unfamiliar courts. Knowing the ropes is more than half the battle.